I think we can all agree that Zapier is friggin’ awesome! It lets you connect more than 750 apps in just about any way you’d like – without getting developers involved. You can set up Zaps to run automations that trigger when important things happen in your favorite business apps and tools. For example, you could have a Zap that sends a Slack message to your #sales conversation when you get a new lead added to your email marketing app with the “Wants demo” tag. 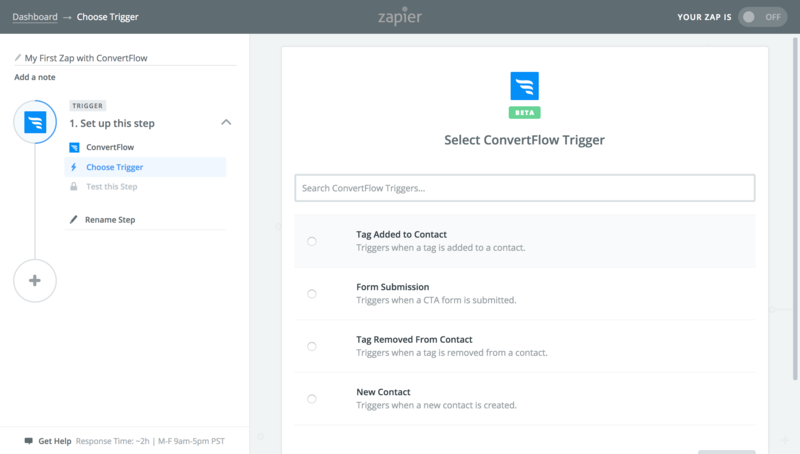 And now, with ConvertFlow’s Zapier integration, you can begin sending your leads to any tool you can connect to Zapier. 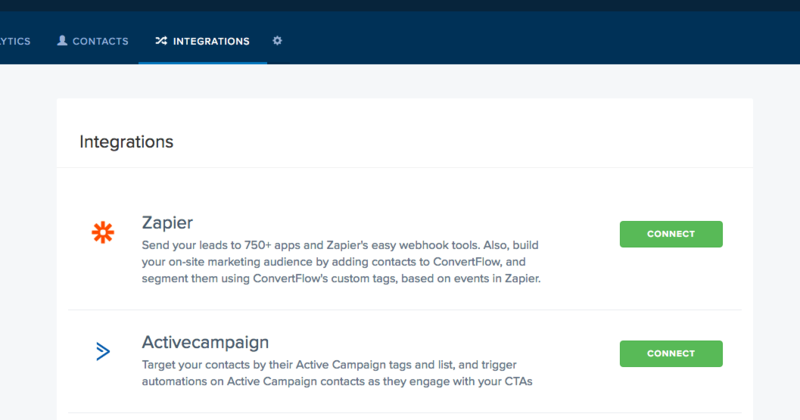 To get started, all you have to do is click “connect” from your website’s integrations area, and this launches the Zap interface in your Zapier account. So, how can you use this to automate your tasks, workflow and improve your marketing? Do you use a CRM that we don’t directly integrate with yet? No problem. Make a Zap! Want to automatically register newly captured leads to an upcoming webinar you’re hosting? Zap! Getting data out of ConvertFlow, and into your favorite business tools, has never been easier. Beyond passing leads to CRMs, this also means you can do all sorts of workflow ninja stuff using your different business apps. Want a new lead to create a Trello card? Zap. Want to send a custom lead alert to your sales team when a new tag gets added to a contact? Zap. Want to send all the form submissions of a CTA you created for a co-marketing campaign into a Google sheet that you can share with your marketing partner? Zap!!! Okay, so you can send data out of ConvertFlow. But what about sending data to ConvertFlow? What if you could send contact info to ConvertFlow’s personalization platform when events happen in your other apps? 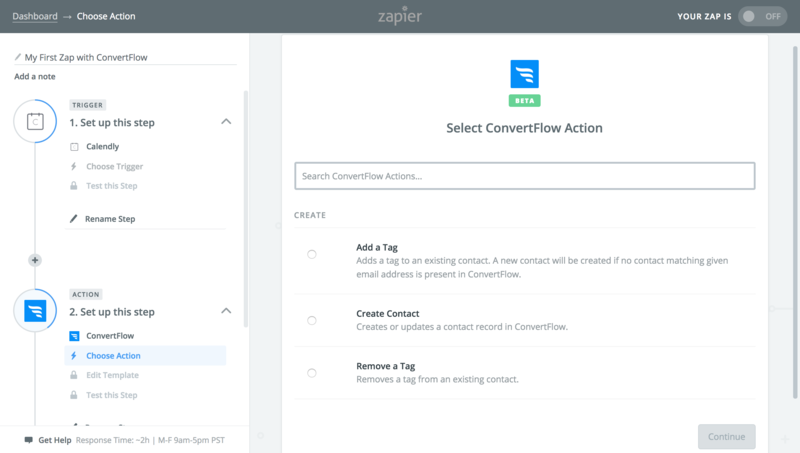 In Zapier, you can trigger “actions” in ConvertFlow. 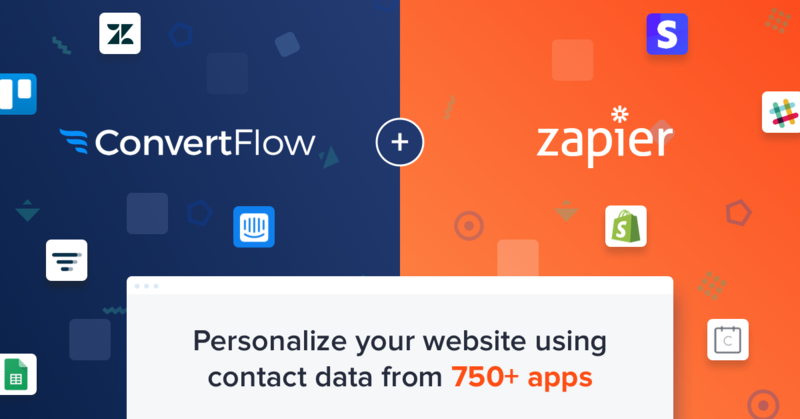 This means you can start sending contact info & segmentation data to ConvertFlow from just about any app that integrates with Zapier. This way, when a subscriber visits your website, you can serve up the perfect CTA. One that greets them, and guides them towards taking the next step. Have a Typeform that collects all sorts of useful contact info when submitted? One that could be used for personalization by ConvertFlow? … Zap!